All of our buses and trams are tracked in real-time, which means you get up-to-the-minute predictions of when your bus or tram will arrive. Save your favourites stops, routes, trips and alarms and keep them for later - just tap on the Saved tab to see them all. The app will let you know if there's any disruptions to your service, plus we can notify you even if the app is closed. Track your bus or tram on a map - you can even share your progress with friends and family. It works even if they don't have the app. We collected your feedback and developed an app to make navigating our network even easier. Now you can quickly find your destination - just start typing and we'll show you places, businesses and addresses that match your search. 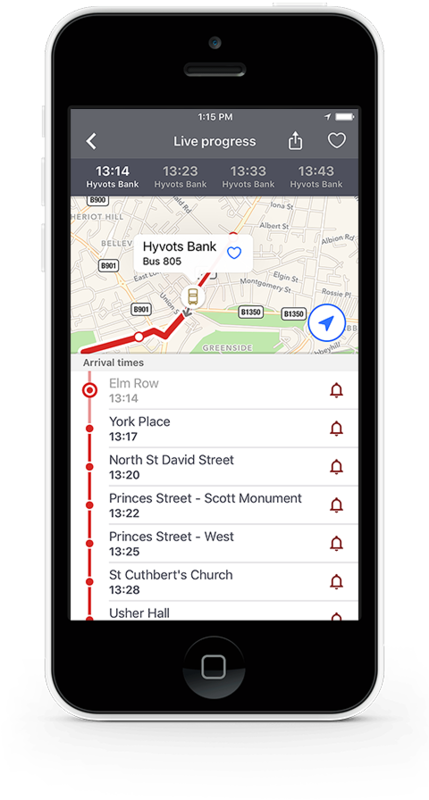 Not only that, but you can quickly search for routes or the bus you're on right now - simply type the service number to show all nearby buses that match. We know most of our customers use the app when they're at a bus or tram stop - so we've made life easier with instant departures. As soon as you open the app, we'll show you departure times for the three nearest stops to you, plus if you tap on any stop on the map, we'll show you a mini departure board - perfect for comparing departure times from different stops. Wouldn't it be great if your phone could track you on your trip, and let you know when your bus or tram is arriving as you approach the stop, or tell you when its time to leave? With step-by-step instructions you can stay informed every step of the way. You're on a bus or tram, and you want to let someone know when you'll arrive - easy! The Live Progress screen now gives you the option to share your trip - send others a message through text, email, Facebook, Twitter or WhatsApp and they can follow your journey in real-time.